The next session of the Shrewsbury Boardgames Club is on Friday 2nd November and is at Garry’s house. This week, there were just the three of us so, for our first taste of the Essen releases, I chose Amyitis, the new game by Cyril Demaegd published by Ystari and Rio Grande. The game is based around the building of the Hanging Gardens of Babylon and each player represents a Babylonian seeking to raise his prestige by building gardens, the irrigation networks needed to support the gardens, by trading, and by recruiting peasants, priests, engineers and merchants to help them. Play takes place over several rounds and each round sees the player performing a number of actions to develop his position. The action takes place on two boards: The Babylon Board and the Mesopotamia Board. On the Babylon Board, recruit actions take place. The player can recruit a peasant to farm for resources, a priest to represent him in one of the three temples, an engineer to provide irrigation for an area of the gardens, or a merchant to gain camels. Camels are needed for the Mesopotamia Board, where you travel from city to city trading the resources you have collected for prestige points or Court cards (that improve certain abilities, such as being able to move further by camel, or income each round), or buying plants that immediately get placed in the gardens for additional prestige, coins, camels etc. The game ends when a certain number of the garden plots have been planted at which time bonuses are awarded for contributing a certain number of plants and whoever then has the most prestige wins. 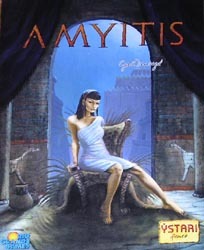 Amyitis is another very nice game from Ystari. At the beginning, there are so many different choices you can make that it takes a while to get your head around what you are trying to do. However, there are many routes to try and progress can be made following very different strategies. The court cards you gain will determine how you try to progress but being frozen out of certain benefits does not doom you to failure. Mark K was unable to get a banker card which made money very tight for him but he was able to adapt and concentrating on the caravaneer enabled him to travel around the Mesopotamia board quite freely. Time-wise, this took us a bit longer than we thought but there is so much going on that the early rounds inevitably took a while. This shouldnâ€™t be a problem in subsequent games. Mark Kâ€™s rating did, however, reflect the time taken to play. The result of our game came right down to the wire with Mark K managing to stop me from planting on the final turn, which would have given me enough to keep the lead. Instead, his 10 point bonus for planting 6 times gave him the win by just 2 points. Just back from Essen after two days of games and talking to friends I’ve not spoken to for twelve months. Here is this year’s haul of new games, not including a present of Le Passe Trappe Micro for Chris and a number of small expansions (Mykerinos, Zooloretto, Master Thieves). Lots of games for the club to go at in the coming weeks. Iâ€™ve tried out 10 Days in Africa as both a 2-player and a 3 player over the last few days and here is my review of it. The components are very good, 2 solid wooden tile racks per player to hold the tiles which in turn are also solid card stock. The slightly strange (for me) bit is the game board of Africa which is a mounted map of Africa with the countries in in five different colours. The bit I find strange is that it is mounted, when the board is only used as a aid to the geography of the continent and not actually played on. I canâ€™t fault itâ€™s durability but maybe it only needed to be a paper map. The game play is quite straight-forward, you start by filling your tile racks one space at a time with an eye to putting together a route through Africa with as little future alteration as possible. Once that is done the remaining tiles form a face down stack and three tiles are turned face up (a bit like Ticket to Ride or Elfenland from the same designers). Each turn a player can take one of the face up tiles or a face down one, which they can use to exchange for a tile on their rack. They then discard onto one of the three face up piles.The idea is to achieve a 10 Day journey around Africa by using a combination of walking, (to an adjacent country) by car (linking two countries by driving through another) and by plane (between any two countries that share the same colour as each other and the plane). The first player to achieve this wins. In my first game after my initial 10 tiles had been selected I found myself only needing 3 tiles and it wasnâ€™t long before I gained the first of those, the Ivory Coast tile. This tile matched nicely with the Burkina Faso tile on one side and the orange plane trip to Chad. A car soon linked me: Mauritania to Niger and before long a second Sudan tile came into my possession, which linked my journey to Chad. This left me needing any one of eight countries to finish (As the other Chad tile had already gone). I only had to wait another two turns and the Central African Republic tile turned up for me to win. 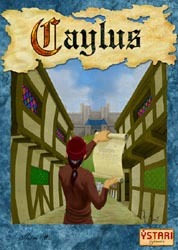 Caylus was the game of choice for the 5 of us, having decided to play a longer meatier game. Me, Will, Mark, Paul and Dave all set off on different strategies. Dave was the castle builder and favour getter, he set about improving his position on the favours track getting extra VP’s. Mark also made progress on the building track but his was the building option. I decided to get some early wooden building in, including the mason with the hope that the others would give me VP’s by using my buildings. Paul had a similar plan and we both went for money on the favours track with perhaps a long term view to buying our way to victory. Will went in completely the opposite direction and decided money wasn’t a problem, he went for extra resources on the favours track; he was to find out later (along with the rest of us) that money or the lack of it can be a big problem. The wooden buildings and then the stone buildings were shooting up so fast that even the seemingly jet propelled provost couldn’t keep pace and the Bailiff found itself well behind the lead buildings. The speed of the Bailiff did however cause a minor panic at the end of each phase of castle development with players having to scramble workers and materials together to get a presence in the castle or suffer the VP penalty. On one such occasion Will did get a worker into the castle but due to forgetting to move the provost to a resource building another of his workers was on, wasn’t able to acquire the necessary cubes to build a part of the castle. He therefore lost VP’s for not building that go and for not having a presence at the end of the phase. That’s the danger in Caylus, it’s about remembering the activation sequence and although you have fixed in your mind that you’ve got the resources from worker placement, you’ve got to remember the other important things like having the resources at the right time or remembering to move the provost to activate them. Later in the game a player (who may or may not have been Will, but whose name rhymes with Bill) wanted to build a prestige building, one worker was placed on the architect and the other on the alchemist to get the necessary gold, but the architect activated before the alchemist and therefore no gold. It’s a mistake that can easily catch you out because in your mind you already have that gold. Will’s money (or lack of it) problem manifested itself later in the game and he found himself only being able to activate 3 workers each turn for a number of turns, this of course had the knock on effect of making worker placement more expensive for the rest of us after the first 3 had been placed. No one seemed able (or willing) to afford to place all of their workers. Using your own buildings (which always cost 1 to use) became very popular. In the final stages Mark had worked himself into a good position and was able to buy the Cathedral (25VP’s), this placed him a good 10pts clear of the rest of us. He then attempted to get the game finished quickly and would have done so had he remembered to send a worker to move the provost. He had the opportunity but I took advantage of his slip to move the provost back 3 spaces and that took the game into a final turn. This gave us back markers a last chance to catch Mark who did have one more card up his sleeve and was able to get a gold resource cube which he used to buy the statue with it’s 7VP’s and one favour (used to get another VP of course). Dave practically finished building the castle single handed and with the favours flooding in he was now getting 5VP’s per favour, he almost caught Mark but finished just 2 points behind. A well worked win for Mark and only 7 points from first to fourth with Will trailing slightly further back. This is one of our favourite games and will no doubt see a early return to the table. Just over a week ago, I got an e-mail from Eric Martin ( the editor of Boardgamenews) to let me know I’d won a copy of the Khet prize pack in the most recent BGN Game Giveaway. 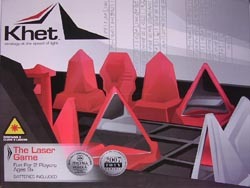 A week later and a box fromÂ Kentucky arrives on the doorstep and I’m now the proud owner of Khet: The Laser Game. The pack includes the main Khet game,Â a beamsplitter expansion and a Khet T-shirt. The game itself looks pretty interesting where you manoeuvre your pieces so that when you fire your laser, the beam bounces off the mirrored surfaces on certain pieces until it hits something solid. If it’s a wall, your opponent gets a go. If it’s another piece, it gets removed from play and if you hit the opponent’s pharaoh (the king), you win. I’ll let you know what it’s like when I get to play it for real, rather than just fiddling with the lasers. Author Garry LloydPosted on 8th October 2007 8th October 2007 Categories SnippetsLeave a comment on And the winner is … me! We played Mammoth Hunters for the second time this year and once again experienced a good close game. There were 4 of us playing which means 2 of the 12 areas of the board start with a glacier on them and there is 25 pieces of stone (the game currency) in the pot. The first round saw Graham adding new hunters far more quickly than any other player and even though he didn’t dominate the areas where the mammoths grazed for the extra victory points that brings, the extra points from his scattered but numerous hunters ensured a healthy 17pts, the rest of us all ended on 12pts. 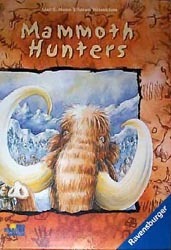 The nature of Mammoth Hunters meant that Graham was mercilessly picked on in the next round but despite this he was still able to hold on well scoring a reasonable 13pts. Tony on the other hand took advantage of this to score 19pts and take the lead by a slender 1pt. I hadn’t been getting hunter adding cards, rather ones that shifted your existing hunters around, in hind sight I should have ditched these cards and cycled through to get what I needed. Consequently I found myself in last on 23pts, but with the consolation of placing a new glacier piece to stuff my opponents. The third round was a cagey affair with all the players trying to set themselves up for the final round and with no-one wanting to play the last ‘dark’ card to finish the round and shoot themselves in the foot. The scores at the end of round three was Tony on 41pts, Graham on 37pts, me on 33pts and Kevin on 29pts. This unexpected rise to third for me meant Kevin placed the new glacier which he inexplicably used to stuff me and Graham and not the leader! The final round seemed to mainly consist of everyone using there stock piles of stones to pay for cards to maximize their points, this resulted in most areas having the same amount of each players hunters, the favorite dark card being played was the remove a mammoth, which as everyone had hunters in mammoth areas was declined. As the last dark card action doesn’t happen in the final round it came down to one player having no stones left to pay for a light card and having to play a dark card that took the remaining stones bringing and end to proceedings. The final count revealed that Tony had held on to edge out Graham by a point despite a mammoth and hunters move card being the last play by Graham. Me and Kevin tied for third (and last). I really like the mechanics of Mammoth Hunters, the light and dark cards, the variable round endings based on either the willingness to take a potential hit or being forced to due to running out of stones and even the last placed player each round gets the fun of placing the new glacier piece to cause maximum grief. It gets a 8/10 for me. The next session of the Shrewsbury Boardgames Club is on Friday 5th October and is at Garry’s house.